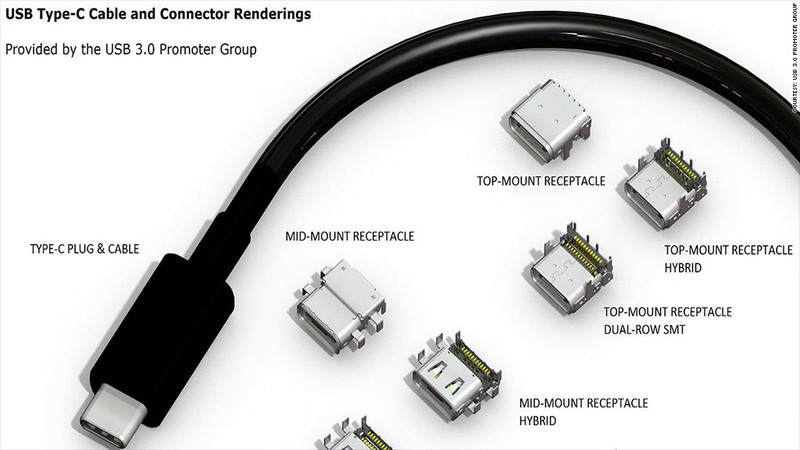 This is the new USB connector - and it's reversible! This new, reversible USB connector is ready to go to market. USBs are getting a big makeover -- and you're going to like the new look. The universal, ubiquitous computer ports, connectors and cables will soon be reversible. That means no more struggling to figure out which way the plug is supposed to go. The USB 3.0 Promoter Group, which includes tech giants Hewlett-Packard (HPQ), Intel (INTC), Microsoft (MSFT), Texas Instruments (TXN), said the blueprints for the "Type-C" reversible USB connector have been finished, and manufacturers can start making them. So when will you see the new plugs? It could be soon, but that's for the electronics industry to decide. There has been no shortage of interest in a reversible USB solution since Apple (AAPL) made headlines in 2012 with its reversible Lightning connector for the iPhone and iPad. But many governments, including the European Union, have mandated micro-USB as the standard for charging and connecting. The oddly shaped micro-USB connector for the world's smartphones, tablets and cameras is slightly fatter on one side than the other. Today's USB connectors can only plug in one way. Making one-sided USBs more annoying is the fact that it's not always obvious which way is the right way to plug in. The 15-year old technology has produced a fair share of headaches from strained, squinty eyes trying to discern which way is up. In addition to being able to plug the cord in either way, the promoter group says the new USB design could free up device makers to position ports anywhere. "This next generation of USB technology opens the door for the invention of an entirely new, super thin class of devices that consumers haven't even seen yet," said Alex Peleg, vice president of Intel's platform engineering group.